Comments: From the first concert on 'The Works' 1985 tour in Japan. Queen did 5 concert on this short Japan tour. All concerts available on pro-bootlegs. Info I have, is that this bootleg has great sound. QUEEN "THE WORKS TOUR" was the last visit to Japan. The last piece to make that Japan collection perfect is appearing. That piece is "May 8, 1985: Nippon Budokan" performance. That is full-audience recording. As I have been told many times, the relationship between Japan and QUEEN is too special. There is also a memorial tour that is the last, so we have archived a lot of masterpiece live albums at our shop. First of all, while organizing the collection on a schedule, let's also check the position of this work. 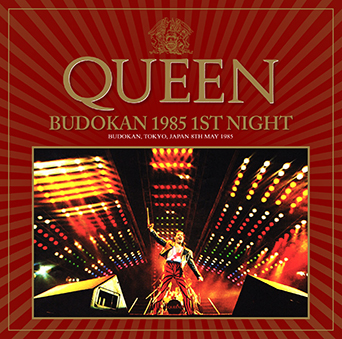 · May 9 "DEFINITIVE BUDOKAN 1985 2ND NIGHT"
· May 11 "DEFINITIVE FINAL CONCERT IN TOKYO"
· May 13 "DEFINITIVE NAGOYA 1985"
· May 15 "DEFINITIVE OSAKA 1985"
Over all, 5 shows. Although the above is the press title which will be the masterpiece of each day, the only thing missing was the first day "May 8th". This work is a live album that you can experience the last full show. Indeed, the biggest point of this work is the feeling of experiences recorded at a stroke penetration. Partial recording was found in this show and we were able to taste the first half of the show with "FINAL BUDOKAN NIGHTS (Uxbridge 066)" with high sound quality in our shop. However, this work is the first time I can hear the full show in total. The sound of such a work is a really tasty vintage audience. It can not be said that it is exquisite for flattering, in fact it does not extend to "FINAL BUDOKAN NIGHTS". 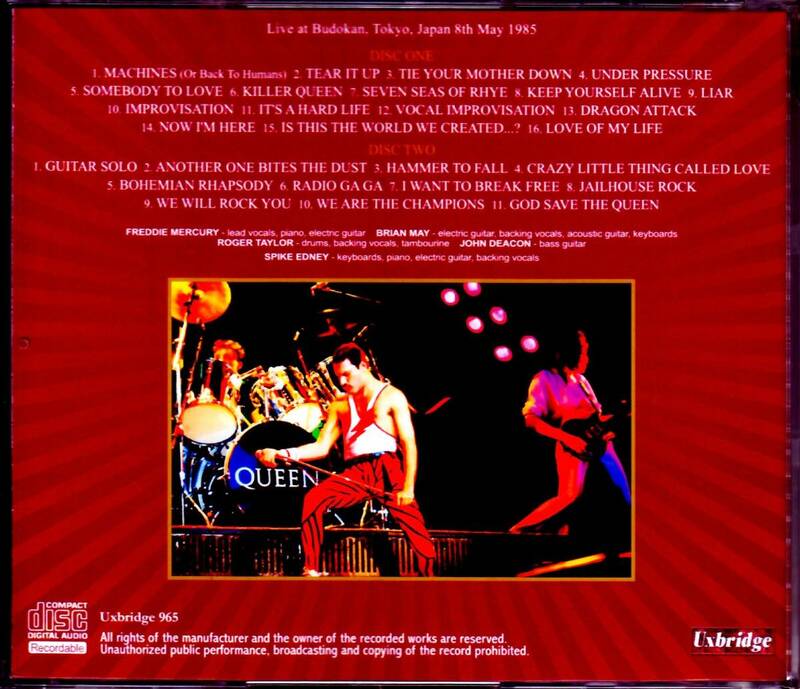 However, it is never a type of recording that looks for QUEEN beyond the noise, and it is not a type that suffers from roaring sounds and explosions. Although it is a rounded sound, its core is extremely thick and pushes forward the great cheers and goes deeply. Some audience acclimatisation is necessary, but if you are familiar it is the sound of the taste that you can listen carefully. Freddie's singing voice is particularly wonderful. To be honest it is difficult to understand the details of the instrument corps with dango, but only the vocal sharply cuts in such a thing. Besides, Freddy is doing great on this day! "May 9th" of the next day is also known for the best condition, but this work is exploding to further tension. As the tone and elongation of the voice is hard to attach, it's powerfully put in one word in this work, the momentum of the word to be released is amazing. This power is a bit difficult to describe, but speaking in a straightforward way, a greeting MC after "Tie Your Mother Down". On the second day of the Budokan, "Is everybody OK? All right ... let's do ... A Little Bit Under Pressure", although it was dignified but calming was stinging, this day is different. It is blowing off "Is everybody HAPPY? YEEEEEEAHHHHH Under Pressure!". It's amazing as its tension does not fall over all the time. Large chorus shaking heart "Liar", followed by Vocal Impro's tremendous voices and richness of phrases (MC say Freddie is "happy to be back in Japan for the first time in 2 years", but this is 3 It is a mistake of the year). In "Day-O" even the audience was overwhelming with overwhelming vocalization and a glittering voice that stretches anywhere without stagnation in the "Is This The World We Created?" Claws the chest (Brian said "From A NIGHT AT THE OPERA ... ... Do you remember A NIGHT AT THE OPERA? "I am doing a little unusual MC). I could listen to "FINAL BUDOKAN NIGHTS" so far, but this work is still "after". I thought, "How tight is the great circle in this tension ... ...." I thought that it is a real sound and it blows out from the speaker. Although it does not correspond to other press masterpieces on the sound side, playing essential is the first day was preeminent. It is a proof that it is an extremely rare album that will let you experience a full show in the last show left. One work that makes the last Japanese performance collection perfect. Please, please enjoy it carefully.